Just seven months after announcing a $20 million Series B, Pendo, a platform to help businesses better understand their customers, has closed a new $25 million Series C led by Meritech Capital Partners. The North Carolina-based startup has been growing at a rapid clip — ballooning to 106 employees across offices in San Francisco, New York and Raleigh. Meritech’s Rob Ward will be joining the Pendo board of directors to help guide future acquisitions and an international expansion strategy. 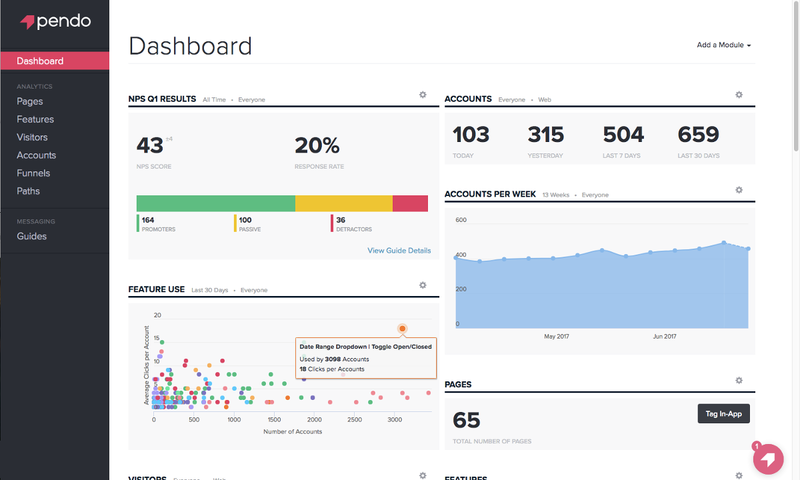 Pendo is a tool that companies can use to track key customer metrics to better understand how users engage with products and services. The company is orienting itself around the rise in interest in satisfaction metrics like net promoter scores (likelihood to recommend products to others) that often are used as a proxy for projecting revenue. Some of Pendo’s early customers, like Cisco Cloud, have seen a 20 percent increase in their net promoter scores since using the platform. With data, Pendo can determine the best ways to engage with users to get feedback — the team found that allowing feedback within products increases response rates considerably with respect to other channels like email. Pendo helps product managers analyze products with polls, contextual analytics, in-app guidance and walk-throughs. Olson told me that his team has discovered some surprising stats in its own course of product development — that, for example, customers typically only spend 10 hours in a 30-day trial testing a service. Armed with this knowledge, the company can offer value to its clients by telling them what users actually engage with during a trial to inform future product design decisions. It’s a common saying that good founders are always raising capital, but Olson insists that it was Meritech that took the initiative in making the deal happen. Meritech approached Olson and was insistent with its interest in leading a growth round. The extra capital opens up opportunities for Pendo to engage more freely in M&A activity — enabling the company to snap up some smaller competitors and perhaps an augmenting technology or two.